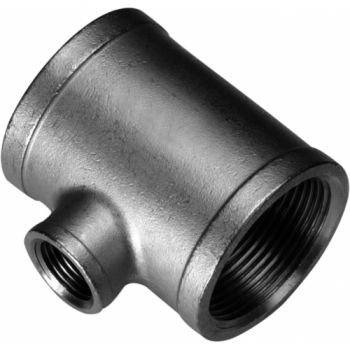 The threaded tee, the most common pipe fitting, is used to combine (or divide) fluid flow. The threaded stainless tee fitting comes with three openings, a wye joins (or creates) branch lines. Usually it is a fitting in which the side inlet pipe enters at a 90-degree angle, or an angle other than 90 degrees. The standard stainless threaded tee is a T-shaped fitting which allows one pipe to be joined to another at a 90 or 45 degree angle. The stainless threaded tees are available with female thread sockets with equal or reduced size on each side. Therefore the tees can be equal stainless tees or reducing stainless tees. Stainless threaded tees can connect pipes of different diameters or change the direction of a pipe run, or both. 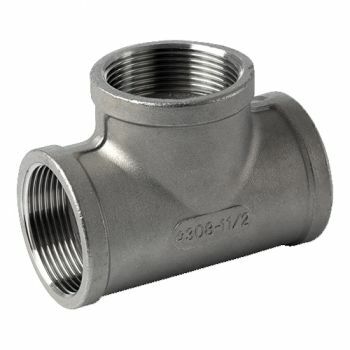 Stainless threaded tee - ISO4144 Equal Stainless threaded tee fittings contain 3 openings of the same size, 2 of which are on the same axis, and the third one is in 90 deg direction. The stainless threaded tees are used to connect 3 pipes which are meeting at a point. It can also be used to combine the flow from two inlets.. Stainless threaded reducing tee Equal Stainless threaded tee fittings contain 3 openings of the same size, 2 of which are on the same axis, and the third one is in 90 deg direction. The stainless threaded tees are used to connect 3 pipes which are meeting at a point. It can also be used to combine the flow from two inlets ..